I am to dolmades what TheHusband is to hotdogs. Or chow mein. Or pizza for that matter. In other words, addicted. Whenever I spot them in our local shopping haunt's deli section I have to grab a small container to scoff as snack before supper time. Containing just 4 or 5 dolmades, it is usually enough to satisfy my gastronomic desires. "Our October 2010 hostess, Lori of Lori’s Lipsmacking Goodness, has challenged The Daring Cooks to stuff grape leaves. Lori chose a recipe from Aromas of Aleppo and a recipe from The New Book of Middle Eastern Food." I was both excited (an unlimited supply of dolmades virtually on my doorstep!) and slightly apprehensive. Would my homemade version match up to the delights of the deli counter this time? Well. The answer to that is both a resounding "no" and a grinning "yes". You see I had the idea to mix things up a tad and put a South African spin on things by using a bobotie-like mixture for the filling. And while there was nothing wrong with the flavour of the finished dolmades, sadly they were a sight for sore eyes, having unraveled during the cooking process and leaving yellow-hued (from the turmeric) water behind, dotted with bits of mince and the odd floating raisin. Not a winner. Attempt number two was inevitable in order to try and salvage my wounded pride and for this one I did my homework properly, consulting various sources (both online and offline) regarding the best way of keeping those darn rolls intact. In the end the key was packing them reeeeally tightly into the cooking vessel - those suckers were squeezed in so tightly they literally couldn't breathe. Let alone unravel. Marisa - 1, sneaky unraveling vine leaves - 0. My South African style dolmades delivered on both taste and appearance (just look at those beauts!) and would make for a great alternative mezze option. The turmeric turns the rice a lovely golden colour and coupled with the fruity, spicy meat, almonds and soft, plump raisins, they truly are a delight. Serve with some Mrs Balls chutney as dipping sauce and you'll be a very happy camper indeed. At first glance this recipe might look long, complicated and somewhat intimidating but I promise you it's very do-able. Once you have your filling and leaves prepared, it just comes down to rolling those little dolmas up into neat little packages and then squeezing them tightly into your cooking vessel of choice. Come back an hour or so later and you'll swear you've stepped straight into your favourite Greek deli. PS: The smell that permeates the air while the dolmades are cooking is pretty fantastic. 1. Heat half the oil in a medium sized frying pan, add the onions and saute until see through. Add mince, turmeric and curry powder and cook for another few minutes or until browned. Stir in chutney, vinegar or lemon juice, sugar, salt, almonds and raisins. Allow to cool slightly before proceeding. 2. Meanwhile, remove vine leaves from jar, unravel and plunge into a bowl of boiling water. Allow to rest for a few minutes to get rid of the brine solution and loosen the leaves from each other. Don't leave too long, or it will turn to mush. Drain. 3. Carefully removing one vine leave at a time, lay the leaf flat on a working surface, wrong side (ie the side with the most prominent veins) up. The smooth shiny side should be facing down.Trim middle stem if necessary (if it's particularly thick). 4. Preheat oven to 180C (350F). Scoop up about a tablespoonful (more or less, depending on size of vine leaf) of the mince mixture, and place onto the vine leaf, close to the base. Gather the filling into a roughly rectangular shape, about 5 cm (2.5 inches) long and a little less than half as wide. Fold the bottom half of the leaf up and over the filling. Fold both sides in, then roll further upwards to form a neat little package. 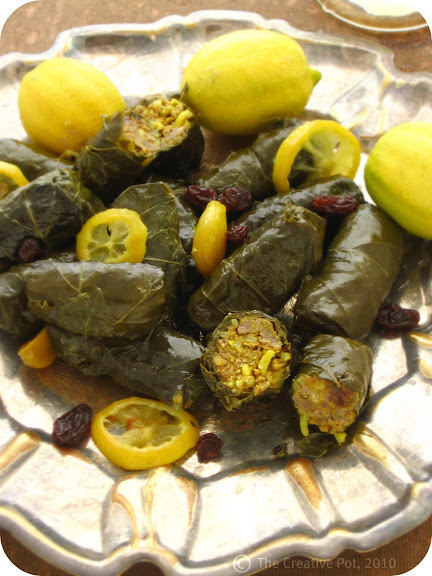 Your dolmades should be rolled fairly tightly, however taking care not to break the leaves. 5. Repeat with the remainder of the filling. Now, pour olive oil in the base of a medium sized casserole dish, spreading to coat the entire bottom. Layer leftover vine leaves (you can use the torn ones for this) on the base, then start packing the dolmades on top. The trick here is to pack the dolmades very tightly - and when I say very tightly, I mean *very*tightly, or else they will unravel during the cooking process. I found it easiest to start by placing the dolmades all along the edges of the dish and working my way towards the middle in concentric circles. 6. Layer lemon slices on top as well as the garlic cloves, if using. End of with another layer of vine leaves, tucking it in along the edges. Now pour water over the dolmades, enough to just cover them and place in the oven at 180C (350F) for an hour. Check once or twice during the cooking time to make sure the dolmades aren't drying out on top - if so add more water. 7. Remove from the oven and allow to cool down completely before removing them from the dish. Serve cold or at room temperature. 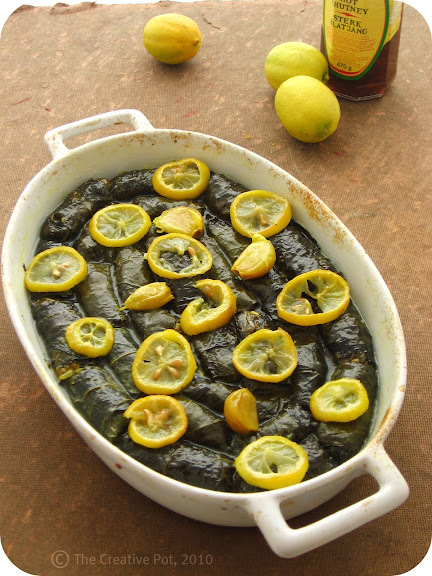 To refrigerate, submerge in a mixture of oil, water and lemon juice to prevent the dolmades from drying out. VARIATION: If you are finding it difficult to keep the filling together when rolling the dolmades, leave the mince raw and just mix with the spices and rice, before shaping into tiny rectangles with your hands. This makes it much easier to roll the dolmades, although you will end up with a much more densely packed filling once they're cooked, which although not unpleasant, isn't quite in the spirit of dolmades. Note that you will also have to increase the cooking time to about an hour and a half to allow the rice to cook properly. The key to making dolmades is to roll them fairly tightly and secondly to pack them very tightly into the cooking vessel. If proper care is not taken, the dolmades will unravel and your filling will float off to never never land. Which, I'm assuming, isn't quite what you're aiming for. Instead of cooking the dolmades in the oven, they can also be cooked on the stovetop. Just be careful to keep the water to a very slow simmer, otherwise you run the risk of agitating the rolls and causing possible unraveling. I have never even thought about trying to make dolmades - I don't even get to eat them that often as there is a distinct lack of Greek eateries hereabouts (which is a damn shame). Looking at your fabulous version, I really with there was some local spot where I could score some dolmades and fast! Great job! Your dolmades look wonderful! Your South African version sounds really good! Beautifully done! I like raisins in my dolmatas, but left them out because my husband likes sour more than sweet. Gorgeous picture! I had a few of mine unwrap, too! They are nicest looking rolled vine leaves and a combination of beef & ostrich well you do live in Africa after all. Great to hear they went down so well with you I like the idea of turmeric which adds a great colour. Cheers from Audax in Sydney Australia. Thanks for a great challenge Lori! I'm glad I persevered too, the feeling of success at the end was well worth it. You should give bobotie a go - it's super easy to make and really yum. Yup, the raisins and chutney gives it that sweet/salty vibe that I love so much. As you mention here I think that was the real key to keeping the dolmades tightly rolled- to keep them tightly packed. I am so glad yo hear you tried again and was happy with your results. Mighty interesting filling. I have been wanting to make bobotie (spelling?) for a while- another challenge. Great job on your perseverance with this challenge. It definitely looks like your work paid off! Wowsers! Ostrich!? Awesome! I'm so glad you tried it a second time and found a flavor that works for you. Looks like you had a lot of fun, too! ;D Seems sort of a sweeter dolma like Stephfood's Turkish ones? I'm very curious about fruit inside dolmas now. gorgeous dolmades! I love the way they look and will definitely try your South African bobotie version sometime soon! I would love to make homemade dolmades! Yours look wonderful and I love the curry, chutney, and raisins in there! The combo of beef & ostrich was quite tasty - wouldn't do just straight ostrich, you need a little bit of fat in there for maximum flavour & juiciness. Thanks for stopping by! They look really great Marisa - and no unravelling at all!!! Bravo! They certainly are tricky! Although, I must say, even when they fell apart, they still tasted awesome. Practise makes perfect though and it really is just down to packing them really really tightly. If there's no space to unravel, they can't! I haven't had much South African food - but when I have eaten it, I have LOVED it. Great job on the challenge! Certainly looks great. I love dolmades too but South African Twist? Thats like WOW! I have never tried making them at home for exactly the same reason tht I fear it won't hold up! Mehh! They look great! Gorgeous photos. I had to quit Daring Cooks myself... lack of time. Thanks Joanne! I think I love both versions equally. :-) Although must say I really enjoyed the raisins as part of the filling. Wow, your dolmades look great. Congratulations on a great job! These look fabulous, and I bet the flavours were too! Love the golden colour of your rice --mine was a dull colour and I had no time to remake them. Great job this month! I love dolmades as is but I think I might love your South African version even more than the Greek original (heresy, I know). I just love the bobotie filling, being at once sweet and savory. You rocked this Daring Bakers challenge girl! I love everything about this recipe (I'm such a fan of dolmades, and have been known to buy a secret stash of them, which I hide in the fridge so no one else can get their grubby paws on them). Most of all, I like the Mrs Balls bottle in the background! These look great! I recently went to a family-owned Greek restaurant in Portland, OR and they shared their recipe for these. I love the South African version you've shared as well! Can't wait to try them. they sound so tasty!! do you have any recipes for preparing the vine leaves yourslef as we have access to a vineyard and would love to do this? You can just rinse the fresh vine leaves and then soak them for 5 minutes in boiling water to soften them before you use them. I am sure the dolmades will taste superb with fresh vine leaves!